Increase in mood, memory, and energy: Using maca regularly has been reported to make users feel more awake, driven and energize. The energetic effects from maca are not jittery as compared with caffeine. PMS and Menopause: Maca has been studied to balance estrongen levels in the body. Having balanced estrogen improves the not so fun symptoms of PMS and menopause. Balance Women's Hormones, Fertility, and Increase Libido: Studies have shown that female animals taking maca had multiple egg follicles mature which is important for ovulation and fertility. Increase Male Testosterone Levels: In clinical studies, serum levels of testosterone were not shown to be affected by maca, however, maca has also been shown to improve sperm production, mobility, and volume, all important factors of increasing fertility. Antioxidant and Nutritional Boost: Maca is packed with antioxidants (which has been shown to alleviate stress), protein, 20 amino acids, fatty acids, vitamins B-1, B-2, C and E, calcium, magnesium, and so much more. 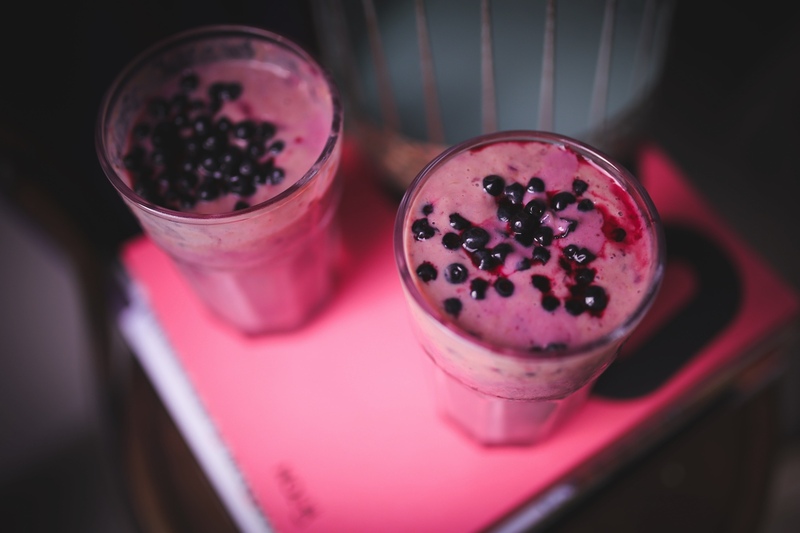 Blend all ingredients together for an energy boosting breakfast smoothie! Optional: Sprinkle whole blueberries and chia seeds on top for extra texture and nutrients.